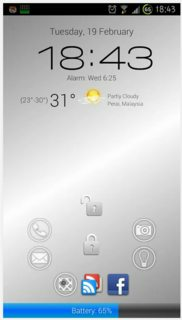 Living in Malaysia, astoncheah is an XDA developer with a pretty good reputation: in just over a year, his C Locker app has been mentioned in no less than six XDA blog articles – which was how it caught my attention. Having not only the current date and time, but also the weather directly on the lock screen was tempting – and thus I fell for it, and also installed C Widget along to replace my current weather-clock widget. As stated in the teaser to this article, the names of his apps usually start with a “C” for “Convenience” and “Customization”. Both aspects made me curious how well they go together, especially as “Easy” starts with an “E”: Does customization come with complexity and complications instead? Not consuming more space on your homescreen, this even obsoletes several other widgets while adding useful shortcuts. You think that’s all about custimizing the widget? I barely scratched the surface, mentioning only the most important parts here. 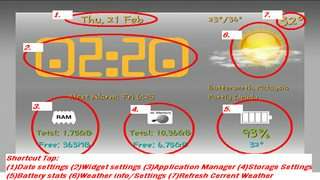 While chosing your own font size, styles, and colors, adjusting the time format to your convenience, selecting your favorite widget background (and setting its transparency) are reserved to the Pro version, even the free version covers a load of other features. You can decide what information is shown (e.g. no text but images only, or hide the weather if you don’t need it), or what action is taken when tapping the areas described above. There’s a choice between two weather data providers (worldweatheronline.com/Yahoo Weather), and a forecast is implemented.1 Update intervals are freely configurable (you can even turn auto-updates off), as well as units used for temperature and wind speed. Moreover, there are two locations you can set: one auto-location always adjusting to where you are, and one manually you can set to a fixed value (searched by your preferred city). on some devices, the element showing information on your external SDCard will wrongly display those on the internal one twice. This happens when the mount-point of the external SDCard is located inside the one of the internal card (e.g. on the LG Optimus 4X: /mnt/sdcard/external_sd). No work-around for that except for ignoring it. Cheah is working on a fix, so it might well be these two culprits are already gone when you install the widget. 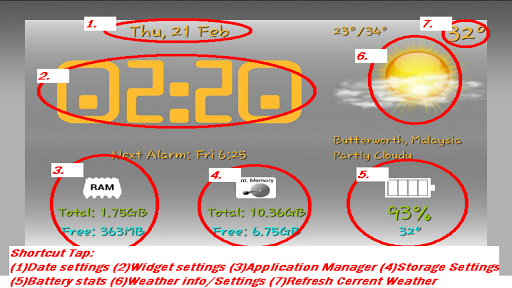 PS: If you have trouble with widget updates freezing after resizing the widget (e.g. on Apex Launcher), try the "special layout size" option in "Other Settings". That solved it for me. C Locker, as you might have guessed by the name, is a lock-screen replacement2. And as the C suggests, a pretty customizable and convenient one for that. In this article, I can barely scratch at its surface: for a full description, it would need an article series. So please forgive me when I only pick a few items here. First, it nicely integrates above described C Widget, so you can have weather details directly on your lock-screen: quickly check conditions without even unlocking your device. This includes the forcasts you can reach when tapping the widget. Plus most of the features already described above – which lets me skip them here. Second, as usual for a lock-screen, there must be something to unlock it. By default, you will see the locker symbol for that. As soon as you touch-and-hold it, a ring around it becomes visible – and either lets you simply unlock the screen by drawing the closed locker onto the open one above it, or directly start an app by drawing it on its symbol. There are seven app symbols you can freely assign to any of your apps, if you dont like the defaults. If you only dislike the icons, those can be replaced separately as well. I especially liked the light-bulb, which turns your device’s flashlight (and in my case itself) on and off, without opening a separate app. That’s pretty convenient: no fiddling around in the dark, looking where to stick your key in when opening a door, or finding the right bell to ring! Third, there’s that “blue bar” at the bottom of the screen, which by default indicates your battery level. You might expect that’s configurable as well – and right you are: not only you can chose a different color for the background, you can also assign a different task to it. I’ve seen screenshots using it as ticker for some RSS feed, and simple things as having a “standard text” displayed are also possible. Next, several notifications are integrated and activated by default. Hold the just described “battery bar” and drag it up, you will see four tabs appearing, telling you about your latest GMail messages, SMS, missed calls, and events of your calendar(s). All without unlocking the screen! But if you’re sensitive about that: of course you can configure some security, disabling some elements, or PIN protecting them – even each of them separately. So far for the “simple things”, which already result in a pretty useful lock-screen – I bet much better than the one your device shipped with. But there’re a lot more things you can do, as the collage to the left shows. C Locker let’s you place pretty much any widget you like on the lock screen. So you’re not “limited” to C Weather for weather information, or the built-in clock for date and time (just take a look at the screenshot in the middle of the collage if you need any proof). You can have your upcoming calendar events visible directly, or the latest items from your favorite RSS feed. Need more? There is. I lied to you above, saying it is a lock-screen. It’s a collection of lock-screens which, once set up, adjusts to your situation. Up to now, I only described the “default lock screen” – but there are two more of them, which you can either configure separately, or copy settings over to adjust. If music is playing, C Locker automatically switches to its “music” screen, giving you the appropriate controls and information. And then, you also can have location based screens – e.g. one for your work place, and another one for home: you might want different widgets available based on that, and you can. And there are many more possibilities hidden in the settings. If your device is rooted, you can convert C Locker from a user-app to a system-app (to give it “higher priority”) and back, directly from within the app. You can hide the status-bar (or just the clock on it, as you don’t need two of them on the lock-screen), or make it transparent. Change the background image (chosing from your gallery), have different backgrounds for each profile. Use nice animations on unlock (if you like). Include notifications from other apps like Facebook or WhatsApp (Android 4.3+ only). Activate a PIN lock, deactivate the home button (requires device-admin), have the screen unlocked remotely by sending a configured “passphrase” per SMS. Use the proximity sensor to automatically switch the screen off when you put your (locked) device into your pocket, or the volume rockers to control your music player (skip to previous/next title). Curious what else might be possible? Cheah seems to have expected that. So in the configs ”About” page, he included a list of links to Youtube tutorials on how-to-do-this and how-to-get-that. The right information, again at your finger-tips. So is everything sweetness and light – or did I encounter any problems? Truth be told, I had a few minor issues. But as far as I can tell, they might well be device-specific. First, switching on my device, it often takes two or more seconds (in rare cases almost five) until the lock-screen elements appear, as if something is keeping them back. I didn’t have that with the “stock” locker. With a quad-core 1.5GHz CPU and 1GB RAM, it shouldn’t be too slow. But I neither found that reported in any of the other reviews, nor can Cheah reproduce it (I might need to do some log debugging to figure out what causes this). And second, with clock, weather, and one more widget (I’ve tried with the built-in calendar events) enabled, the “locker wheel” gets pushed down too far, so its lower parts disappear below the “battery bar” – which according to Cheah might be caused by the “lower screen resolution” (uh, it’s an HD display, 720p – but Cheah uses 1080p). Here a future update shall bring a solution, permitting to specify the position of the locker-ring. Conclusion: I can warmly recommend C Locker, as well as C Widget. Both are feature-rich replacements of the corresponding stock-apps your device ships with, and you will surely enjoy them! Nothing to blame the dev for! But unfortunately, I have to blame others. There are some pitfalls I already mentioned in my article on updates in general3: to protect his apps against software pirates, Cheah had to use some license service. Obviously he chose the one available to most Android users: Google licensing, which works via your Google account. Wouldn’t be necessary without those pirates4. But as it had to be done, the Pro versions don’t run on a “Google-less” device. yes this is possible. It is also possible that an app contains some ad networks but doesn’t actually use them. We are working on improving the detection especially for this problem you mentioned with Google Play Services. By the way: Of course I first contacted Cheah on the issue, thinking he might simply have forgotten to take out the ad module. He immediately claimed his responsibility as dev, and did his best to find a way out of this misery. But though he cut all ties he could (isolating the ad module’s interface, to make sure it remains inactive and has no access whatever to the app), the detector insisted it was there. And for obvious reasons, he cannot simply drop the library. Given his reputation at XDA, and his picking up responsibility as soon as I brought the issue up5, I ask you to do the same as I did: trust him on this. I’ve initially said the “C” stands for convenience and customization. But of course many of you already have guessed, it also stands for “Cheah”, the name of the dev. Which, according to the Urban Dictionary, means as much as: Yeah! Because: with Cheah, there’s an active developer behind the apps, who responds to your questions and really cares for your concerns (as my story with C Locker clearly shows). PS: His next big thing is already pending, C Floating Tools should arrive soon on a device near you. As usual, they will be fully C (and you can “c” a screenshot-preview to the right). Are you ready for them?